The end of senior year is usually a scramble to mail résumés, apply for jobs, network, and prepare for interviews. However, for Alicia Marchant ’10, a School of Business graduate who majored in business administration with concentrations in management and finance, senior year was none of those things. 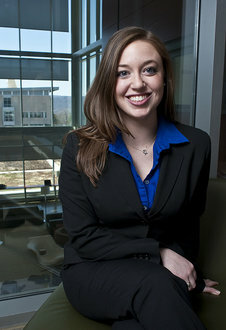 After completing an internship with Liberty Mutual in the summer of 2009, Marchant was offered a job upon graduation. And with a competitive starting salary, this isn’t your typical entry-level job. Marchant landed the summer internship right here on campus when a Liberty Mutual recruiter came to one of IC’s job fairs. She went through three interviews before being offered the internship. A week of professional online training prepared her to work in the branch office in Vestal, New York, about an hour southeast of Ithaca. Marchant took all the proper courses (paid for by Liberty Mutual) and passed all the requisite exams, earning her property and casualty insurance license (home and auto) and a life insurance license during the course of her internship. Within just a few weeks, she was making appointments, meeting with clients, and assisting her coworkers with selling insurance. She may have been an intern, but she was treated as anything but one. Marchant provided consultation to clients, analyzed their financial situation, determined what they could afford, and whether or not they needed insurance. Every day on the job involved something different, but Marchant says she valued the versatility and flexibility of the job. “I met with at least one new person every day,” she says. Every new face presented a new situation and allowed her to practice skills, whether they were relevant to selling insurance or relevant to her presentation tactics. “Knowing what you’re selling and being able to understand rates is just as important as your personal skills,” says Marchant. The internship also gave her valuable experience outside of the office. During her time with the company, Marchant attended several corporate and public relations events with various companies, using her knowledge, skills, and personality to represent Liberty Mutual. At the end of the summer, she was nominated by her branch to attend a conference in Boston as a “Responsible Scholar,” along with 116 of the 427 other Liberty Mutual interns from all over the United States. The students took part in an orientation at corporate headquarters, went sightseeing, and attended two special dinner events. They met and networked with the CEO of Liberty Mutual, Edmund F. Kelly, and other major administrators. At the end of the weekend, a majority of those selected interns were offered jobs. Marchant started her job in the Vestal office on June 21. “I didn’t realize how much they valued interns,” says Marchant, who was thrilled to have a wonderful job waiting for her upon graduation. She went into the internship looking for experience with no guarantees, but she left with a job and a phenomenal knowledge of the industry.